As we sat down in his home in Zamalek, peeking at the Nile from his fabulous balcony that overlooks the river, I was going over the question I spent the whole night writing and rewriting while waiting for my first meeting with Samir Amin, one of the greatest economists I had ever heard of, a man who has more books mentioning his name than the prolific number of books, papers and articles he authored. He emerged and greeted us wearing a traditional Egyptian navy blue galabiyya, something you would only wear at home or in a casual setting with friends. While I expected that such an interview would be more formal and strict, I started to ask myself if that meant that this will be a long or a short interview, but before I could find an answer to my questions, he started the conversation with the kind gesture of offering to change his clothes in case we intended to take photos. From that minute forward ran a prolific conversation over capitalism, Islamism and equality that lasted for more than two hours, a lot longer than we ever expected. In fact, parts of that interview are still unpublished six years later. 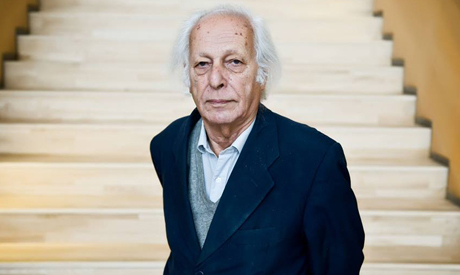 Samir Amin, who departed our world on Sunday 12 August at the age of 86 in Paris, less than a month from his 87th birthday, was one of history's most radical Marxists and economists, who championed equality and social justice in face of the cruel and brutal capitalism, especially in its neo-liberal phase. The author of The Liberal Virus was hospitalized in Paris on 21 July with a brain tumour, discharged from the hospital last Saturday, and then promptly died the next day on Monday 12 August. He described himself as a "creative Marxist" who believed that we should “begin with Marx, but not end with him, Lenin, nor Mao." In a 2011 interview with Lebanese newspaper Al-Akhbar, Amin revealed the story that determined his whole life as a Marxist. Samir Amin was born on 3 Sep 1931 to an Egyptian father and a French mother, both of whom were medical professionals. The late economist was only expected to live a few days after his birth, for Amin was born weak and ill with biliary secretion, and was unable to get any oral nutrition as he spat even water out. He was only alive through solutions that were injected into him; his condition was so bad that some family friends advised his parents to let him die, but his French mother insisted on giving him all the care he required. By the time he turned one, his family had visited a village in Egypt's Nile Delta when they ran by a peasant who asked them about the baby's health. After the mother explained his condition in detail, the peasant invited them into her home to help find a treatment for the boy. The peasant gave them a mix of herbs and within a few days, Amin was completely healed, but the doctors insisted that he stay away from certain types of food until his adulthood, the foods that all kids love: candy, chocolate and ice cream. The genesis of Amin's strong self discipline and his socialistic viewpoints began at that moment. At the age of six, he saw a little boy digging through the trash for food and he asked his mother why the boy was doing that. His mother said "because society is bad", so he replied "I'm going to change that society." That incident stuck with Amin and influenced his decision to study economics. After studying in Egypt, he went on to receive a diploma in political ‎science in ‎Paris in 1952 before getting a degree in statistics and then a doctorate in ‎economics.‎His thesis was titled The Origins of Underdevelopment – Capitalist Accumulation on a World Scale, which he published in a book in 1970. He returned to Egypt in 1957 to work at the Institute for Economic Management before he left Egypt after realizing Nasser's problems with Communism. He then ‎moved between countries and became director of the Third World Forum in ‎Dakar, ‎Senegal in 1980. Throughout his academic life, he introduced many concepts such as euro-centrism and the idea of the centre and peripheries. In his analysis of the global accumulation of capital, he defined two distinct patterns: the centre and the peripheries, where development is at the centre while the periphery is dependent on the centre. In a paper published in January 2007, Samir argued that "central development is characterised by the dominance of economic activity to satisfy mass consumer needs and the consequent demand for production goods. The power of the masses is enlisted in a 'social contract' that allows the establishment of a limited economic viability at a national level. However, the internationalisation of productive capital increasingly threatens that stability. The peripheral systems are dominated by production of luxury goods and exports and the consequent lack of importance of internal mass markets. This leads to growing inequality, technological dependence, political weakness among the oppressed — in sum, marginalization." He expanded on the idea in a 2012 interview by saying that "capitalism is centred around polarization between centres and periphery, determined by the law of value; a model that applies to capitalism throughout its historical evolution, and the polarity increases throughout since the logic of capital accumulation doesn't enable the periphery to ever catch up with the centres." He therefore saw capitalism and imperialism as interdependent phenomena, for the first cannot exist without the second, although throughout history the imperialist model changed and thus so did the relation between the centres and periphery. Since the masses at the periphery reject this situation, the capitalist system was never stable and history witnessed this tension on the political level. Amin has always called for a multi-polar world, where America doesn’t have the power to solely rule the world. He believed that world capitalism maintains its rule through five monopolies – control of technology, access to natural resources, finance, global media, and the means of mass destruction. And that only by overturning these monopolies could real progress be made. Amin has vehemently criticized imperialist attempts to "help" the economies of the periphery, saying that any effort that doesn’t denounce imperialism first would fail as it doesn’t challenge the existing structure of power that controls the world order, an order where peripheries (developing countries) would supply the centre (western countries) with the means of development while themselves staying underdeveloped. The author of Capitalism in the Age of Globalization tied his stance on Islamism and the Muslim Brotherhood with his stance on capitalism and imperialism. He believed that they would apply the same neo-liberal policies that the centre wanted applied on the periphery once they were in power. He argued in an interview in 2012 while Egypt was still under the rule of the Brotherhood that the Brotherhood was "liberal economically," and not just a conservative party. He thought that the Muslim Brotherhood shouldn't be looked at as just a political Islamist power, but also as a "backward movement that rejects workers movements and social justice, and prefers to talk about charity as a way to ensure their control over the people. The Islamists accept the policies of dependency under the guise of open market and private ownership rights; they openly accepted the American role in the region and their support for Israel, including the Camp David agreements." Samir Amin believed that what happened in Egypt in 2011 was bigger than an uprising, but short of a revolution. He was a radical and creative thinker who rejected dogmas and historically accepted facts and theories in favour of an approach that "takes proper account of the perspective and aspirations of the truly dispossessed in the world."